Asian Fusion Tacos may be my new favorite thing. Komodo, created by Chef Erwin Tjahyadi, started as a food truck roaming LA, much like a Komodo Dragon. Serving up flavorful tacos and burritos with flavors inspired by Tjahyadi’s diverse background, the Komodo truck is popular wherever it roams. 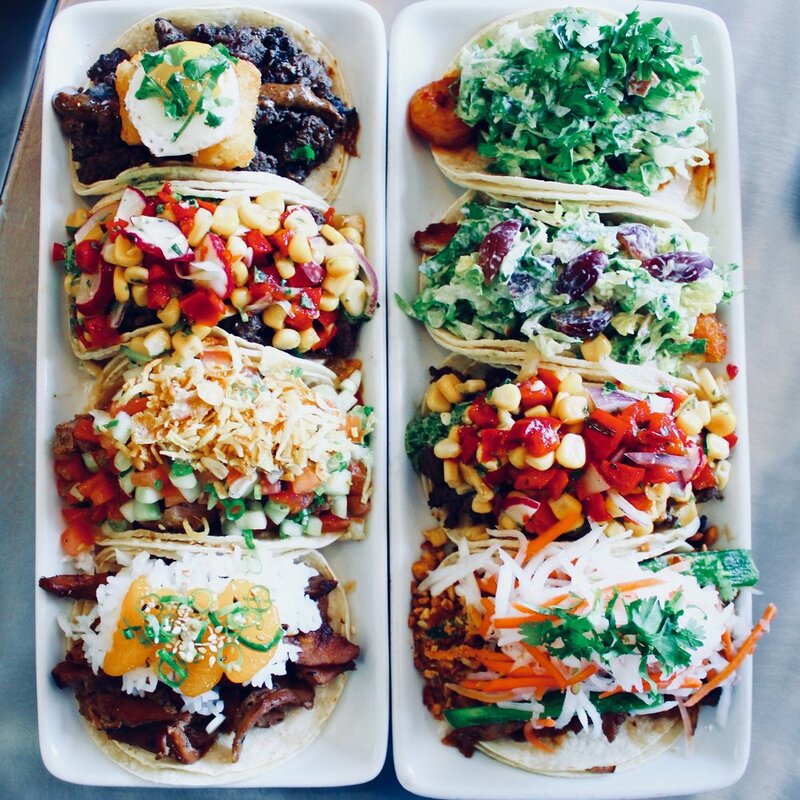 Tjahyadi combined his classical French training with a passion for Mexican food and his Southeast Asian heritage to create a flavor so uniquely Californian. The truck gained such notoriety that Komodo now has two brick and mortar locations—one in Venice and one on Pico-Robertson. I had the pleasure of dining at the Pico location. The shop doesn’t look like much from the outside, but inside it is sleek and stylish, with a lunch rush that will make your head spin. Obviously, when dining at Komodo, you need to taste the tacos. I recommend the Komodo 2.0, Blazin Shrimp, and the Bahn Mi Chicken. The Komodo is the top seller for a reason; it is seared top sirloin steak, jalapeño aioli and southwest corn salad. If you like a bit of a kick, try the shrimp. But when I say “a bit of a kick,” know that it is spicy! It’s made with Spicy Singaporean-style shrimp, sour cream salad and cilantro. And for a true sense of the Asian Mexican fusion, the Bahn Mi is the way to go. It is marinated chicken with Hoisin aioli, crushed roasted peanuts, jalapeño, pickled shredded daikon, carrots and cilantro. 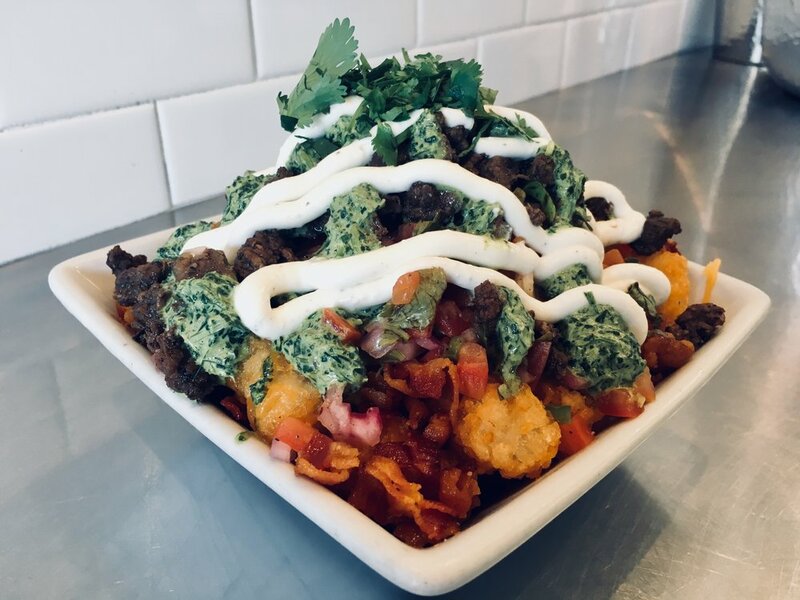 You’re also going to want to try the Brutus Tots Salad—tater tots and steak with jalapeño aioli. So generously portioned, these tots are enough for an entire meal if you don’t bring a friend or two to share it with. I was in love with each bite, and to be honest, I’d go back just for this. Komodo offers plates too, like the seared and oven baked salmon in ponzu sauce served with rice and salad. I saw someone eating that while I downed my tots, and it made me feel healthy just looking at it. It is definitely on my list of items to try next time. And be sure to try the mango lemonade! It was so sweet and perfect for washing down the spicy shrimp taco. Komodo is reasonably priced, no frills, and delicious. So basically, it is exactly what you want in a taco. I’m all about it.